In September of 2015, nearly 40 Chapman Stick players gathered on the Spanish island of Mallorca for Stick Camp, hosted by Barcelona-based Stickista Guillermo Cides. This “musical vacation” featured Stick players from over a dozen countries, and performances every night, often including group music written during the Stick Camp. Participants shared lodging and meals, and breakfast ideas often became evening realities. With so many players, each evening’s performance was completely unique. A jazz standard followed by a classical piece. Original vocal and instrumental pieces one night; Latin, Celtic and Russian prog-folk the next. Players who had never met before combining in duos, trios and larger groups creating music for that evening’s performance. Beginners, intermediates and professionals onstage together. In the spirit of Stick Camp Spain, we bring . . . Stick Camp Canada: May 23-28, 2018! 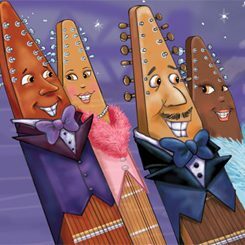 Stick Camp Canada is a Musical Vacation for people who play the Chapman Stick, the 2-handed tapping instrument developed by Emmett Chapman. It is a gathering of players of all skill levels, in order to share ideas and make music together. It is a 5-day, all inclusive, Stick immersion experience on the shores of Gabriola Island in beautiful British Columbia. Stick Camp Canada is an opportunity to mingle, learn, compose and perform with fellow Stick players from around the world. Stick Campers share meals and accommodations in a rustic retreat nestled in the woods, and literally steps from the beach. Stick Camp is a great opportunity to share ideas and techniques. Stick Camp Canada is our 5th, and longest, visit to Gabriola Island. The place: Beautiful Gabriola Island. The Georgia Strait is a part of the Salish Sea and separates mainland British Columbia from Vancouver Island. It is home to the Northern Gulf Islands (those islands north of the Vancouver Island city of Nanaimo) and the Southern Gulf Islands (south of Nanaimo). Gabriola Island is the northernmost of the Southern Gulf Island and sets about 5km east of Nanaimo and is connected by a 20-minute ferry. Gabriola is just over 50 sq. km (20 sq. mi) and is home to about 4, 000 permanent residents. The island has an active Arts community, with festivals celebrating arts, theatre, poetry, music, gardens, boating and fishing held throughout the year.